In 1984, just outside of Rhyolite, Nevada, a ghost town off the road leading to Death Valley, California, a group of Belgian artists, created the outdoor sculptures that make up the exhibits at the museum. 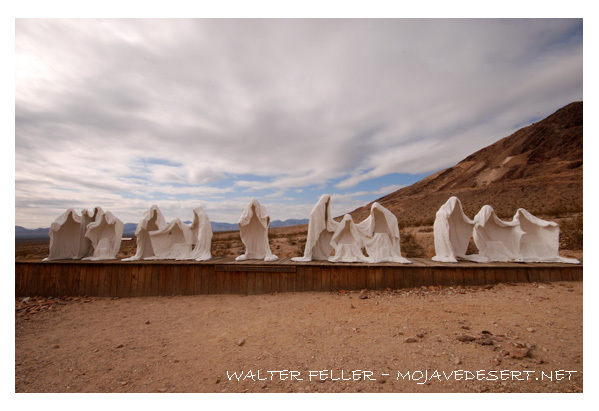 The Museum began with the creation of a sculpture by Belgian artist Albert Szukalski titled “The Last Supper”–an interpretation of Christ and his disciples sited against the backdrop of the expansive Amargosa Valley. To make the life-size ghost figures, Szukalski wrapped live models in fabric soaked in wet plaster and posed them as in the painting “The Last Supper” by Leonardo Da Vinci. When the plaster set, the model was slipped out, leaving the rigid shroud. Szukalski then coated the work with fiberglass making them weather-proof. In subsequent years, six additional pieces were added to the site by three other Belgian artists who chose to create in relative obscurity in the Nevada desert near Death Valley. Decades later, artists from all over the world, having heard of Goldwell, still seek out this place. Goldwell remains a place for those who seek adventure in their art making in a spectacular and challenging landscape. The sculpture park is free and open to the public 24/7. The Goldwell Open Air Museum is located in the State of Nevada near the ghost town of Rhyolite and the mining town of Beatty. It is approximately 4 miles west of Beatty off of State Highway 374, the road that leads to Death Valley, California. Beatty Nevada is 115 miles north of Las Vegas on Highway 95.